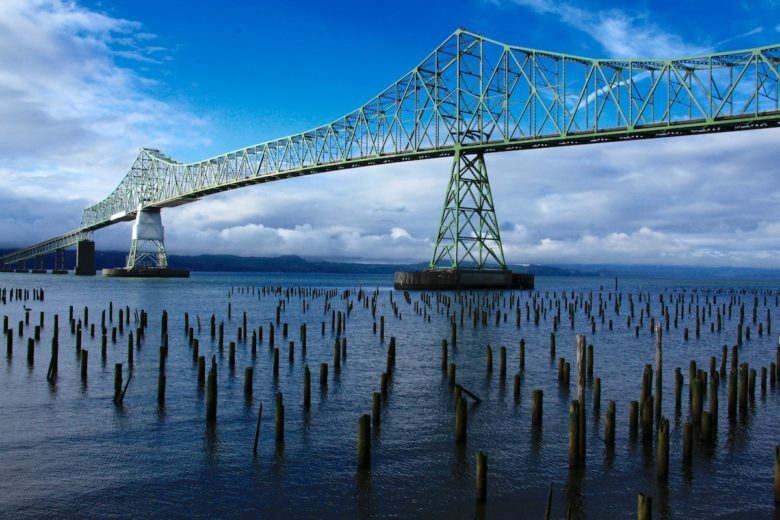 Astoria . 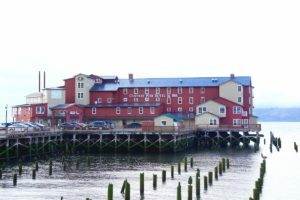 . . a weather-worn town on the Oregon side of the Columbia River where the cold, steady salty sea air and penetrating winds have done their etchings for a long time. Nevertheless, the city’s persevering character begs to be noticed. Arnie (you know, my alter ego) and I donned our jackets and left the River Walk Inn to get to know her a little better. I have the feeling, however, that one could live a lifetime and never know her through and through. Not wanting to miss the subtleties that require lingering attention, we decided not to take the trolley that runs along the waterfront. 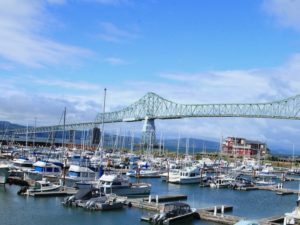 We began our walk a bit west of the Astoria-Megler Bridge. Across the small craft harbor between our hotel and the bridge, stood a bight red stay-with-me hotel. One has to admire the builder’s audacity to place the huge structure in the teeth of the frequent storms the thrash the mouth of the Columbia . . . winter and summer. Stubs of dark pilings sticking out the water told us that this was the section of waterfront that was home to the once thriving fish canneries. I repeated his question to an aged fellow leaning against the rail. Arnie whispered in my ear. “Arnie says that doesn’t make sense,” I said to the man. The ancient mariner lowered his pipe and looked at me askance. “They’re made of wood . . .why don’t they rot?” Arnie asked. 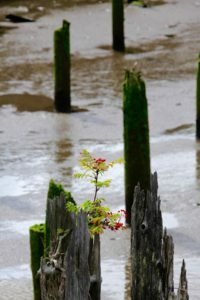 “Why don’t the pilings rot away?” I asked giving voice to Arnie’s concern. I thanked the old fellow for the history lesson. Arnie and I walked away. Of course, I looked. 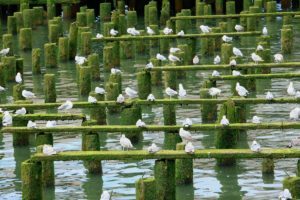 There, squatting on moss covered planks spread across an array of pilings, were sea gulls. 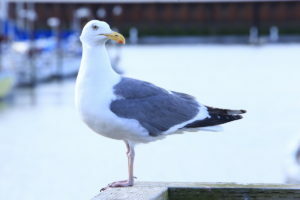 “A seagull convention,” I said chuckling. “Wonder what their liturgy looks like,” I said not expecting Arnie to answer. We laughed louder. A lady hurried past keeping her distance.